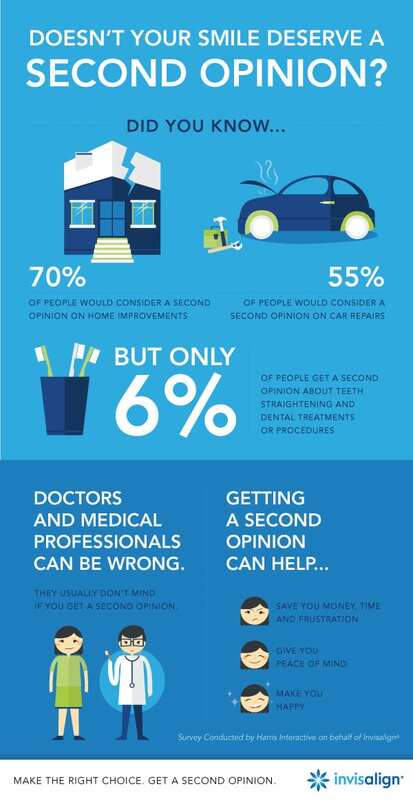 In a recent poll, conducted by Harris Interactive on behalf of Invisalign, it was found that Americans are more likely to seek a second opinion for a major car repair than for a medical procedure or straightening their teeth. That's crazy right? I seek a second opinion about everything, but I guess, seeing how much it costs to go to the doctor or dentist, you might not seek a second opinion and trust the first to skip the hassle. When it came to straitening my teeth as a high school senior, I wish my family had asked for a second opinion. I spent the entire year not smiling big because of the ceramic and metal braces I had in my mouth. I begged my parents for Invisalign, but seeking a second opinion meant driving much further and getting all new appointments and files transferred to another office. We were told that my problem was too complex for Invisalign treatment. I recently found out that I could have tried them for the problems I was having. They now can effectively correct a broad range of more complex dental problems such as: overly crowded teeth, widely spaced teeth, open bite, cross bite, overbite, and underbite. I spent even more time visiting my orthodontist because I broke or chipped my ceramic clear braces all the time. Plus, the clear bands stain instantly, so I couldn't eat mustard or anything with a strong color too it unless I was getting them changed the same day! These two factors made the cost of braces much higher than originally planned. I would have been smiling much more my senior year if I had just gotten Invisalign. As with any medical procedure, consider getting a second opinion if you are told you or your child is not a candidate for Invisalign. Not all dentists and orthodontists are certified Invisalign providers, the best way to find an Invisalign provider is to visit the Invisalign Doctor Locator. Invisalign is holding a Second Opinion Sweepstakes & Instant Win to help bring awareness to the importance of a second opinion. Invisalign is giving away $50 a day in instant win prizes through October 15th plus a chance to win $1,000 grand prize in their Second Opinion Sweepstakes and Instant Win. Enter each day until you're a winner!